Note that FixturesCloseUp took poetic merchandising license to play up this Sweet Baby Ray’s Vs Bridgeford Beef Jerky En Masse presentation. Seen from a distance, Bridgeford chose to emphasize their name, tag line, and Beef Jerky as the primary sell. 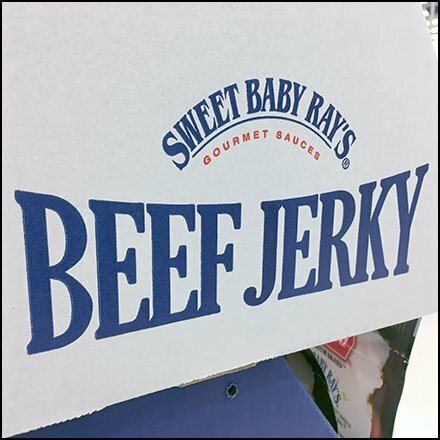 I suggest Sweet Baby Ray’s might be the true sell, because otherwise isn’t beef jerky just beef jerky no matter the brand? Pardon my intrusion into the competitive world of beef snacks, but consider the proposition. This Sweet Baby Ray’s Vs Bridgeford Beef Jerky En Masse seen at Target.